Saint Aloysius had four great devotions in his daily life: the first was, as mentioned before, to Our Lord in His Real Presence in the Most Blessed Sacrament. Indeed, it is a special wonder in the Providence of God this year, 2017, that the feast of Saint Aloysius Gonzaga is commemorated secondarily today, the seventh day of the Octave of the Solemnity of Corpus Christi in those venues where the General Roman Calendar of 1954 is observed. Nothing could be fitting than for Saint Aloysius to remembered secondarily during the Octave of the Solemnity of Corpus Christi as his indescribable ardor for Our Lord in in the Most Blessed Sacrament was so perfectly pure and angelic that it can be said that he sought only to be one with the Divine Guest he received so fervently in all that he thought, said and did. Four hundred twenty-six years have passed since his death. The brightness of his love for Our Lord in His Real Presence still illumines the path of those First Communicants, who are given Saint Aloysius as an example to imitate as they prepare to receive Our Lord for the first time in Holy Communion. 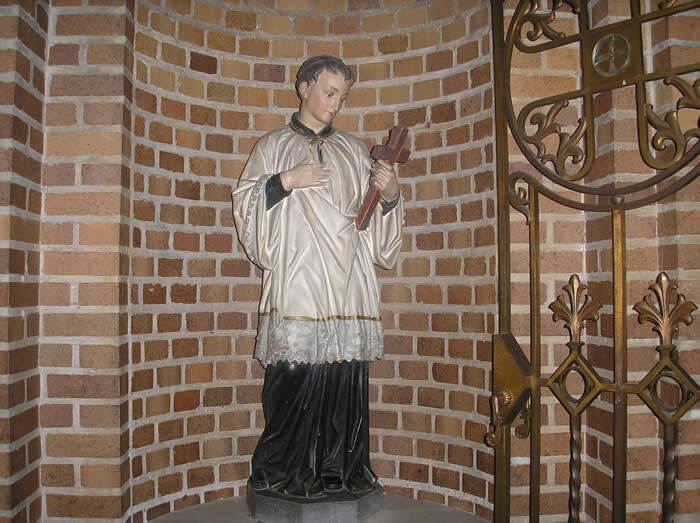 How fitting it is that both Pope Benedict XIII and Pope Pius XI declared Saint Aloysius Gonzaga, S.J., the patron of youth.